Penelope Crawford's two discs of late LvB sonatas rate among my favorite HIP Beethoven recordings, so when I saw this disc with her as accompanist for Martha Guth in a selection of Schubert songs for a few bucks, I snapped it up. The conceit for the disc is to explore how Schubert wrote lieder where the subject is a woman, as performed by women. The learned and lengthy liner notes were also written by a woman, though I'm not sure the brief mention of Goebbels adds much value. So far, so good, except the Goebbels part. Unfortunately, the conceit is better than the execution. One of the highlights of Crawford's two LvB discs in the SOTA sound, allowing one to hear every little bit of sound produced by her instrument. The sound of the keyboard here is more distant and opaque, partly because the singer has to be captured. Sound is very good, it's just not great. The same can almost be said about the performances. I tend to prefer my Schubert lyrical, though I also fancy some hard-hitting Schubert, and fortepiano just can't deliver the goods like a modern grand. As to singers, when I listen to Schubert lieder, I tend to listen to male singers, which is unusual since I definitely prefer the sound of women's voices. This disc more or less reinforces my existing preferences. It's not that Guth is bad, though she's not in the same class as Christine Schäfer, who can deliver some exceptional Schubert, it's just that her singing doesn't really work for me. Even the slam-dunk famous pieces (Gretchen am Spinnrade and Ave Maria) are kind of ho-hum. The disc has been ripped and boxed up, and I'll listen to it again some time in the future. Or not. The booklet essay is only 3 pages long and does not mention any Nazis. 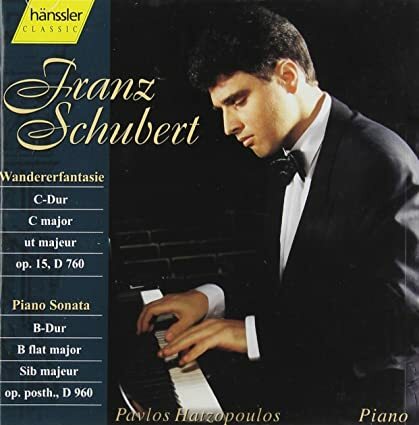 For a few bucks, I figured I could take a chance on Pavlos Hatzopoulos' Schubert disc on Hänssler from way back in the last century. The German pianist has a thin discography, though a new title with Bach and Beethoven works was released just this year. This disc contains two Schubert warhorses, the Wanderer Fantasie and D960. It opens with D760. Hatzopoulos plays it directly and seriously. There's little poetry, but ample clean playing, sometimes with some heft. He's especially adept at bringing out left hand details without making the lower registers dominate. As the piece continues, the clean playing becomes the main attraction as lyricism or high levels of energy or even fantasy never really materialize. Execution is good enough to make the approach work well enough to satisfy, even if it's not a Top Ten choice. D960 starts with a repeatless, slightly quick, slightly tense Molto moderato that moves forward at a steady pace, displays more clean playing, and some nice bass trills, but otherwise is mostly characterized by unflinching directness. The short opener shifts the center of the work to the Andante sostenuto, which under Hatzopoulos' fingers becomes more an Allegretto. It's quick and tense in the outer sections, and completely devoid of sentimentality or sadness. The middle section speeds things up even more, becoming agitated and agitating, in a good way. The Scherzo is likewise swift, but that's far more common. Hatzopoulos does maintain an admirable steadiness and clarity in his playing, though. In contrast to the preceding movement, the concluding Allegro ma non troppo sounds a bit restrained tempo-wise, though it's really just fairly standard. The clarity and steadiness are there, but it lacks the oomph of the inner movements, except in the coda. Overall, like D760, there's enough to satisfy, but it's not one of the great recordings of the work and the disc is not essential. I fancy PBS recordings. His two LvB sonata cycles are very fine, the HIP cycle on Astrée, especially. 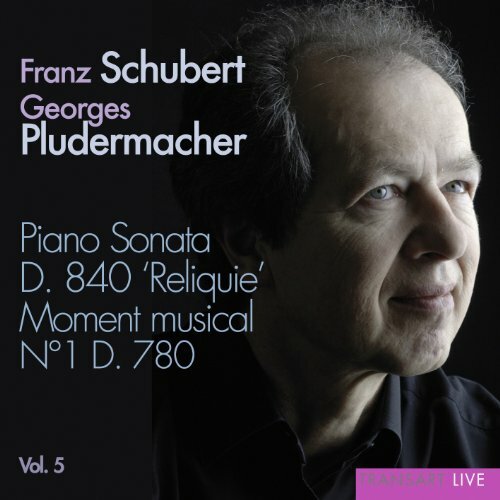 The other PBS recordings I have heard have all been good, though his HIP Schubert on Arcana shows the limitations of older keyboards in producing the lyrical Schubert style I prefer. Others may very well be more taken by HIP Schubert, of course. Anyway, since PBS is the only pianist to record Mozart, Beethoven, and Schubert sonata cycles on both modern and period instruments, when this reissue of PBS’s RCA Schubert on modern grands became available, I thought I really ought to get it. Disc one of the CD set is given over to the first disc of the second volume from LPs. This shift in presentation allows for this set to be presented in Deutsch number order, with some duplicate recordings tacked on at the end of the set. To the recordings: D157 opens with a light, crisp, very classical Allegro ma non troppo that mostly just sounds a bit clipped here or there but otherwise quite nice. At least until the middle of the movement, when PBS aggressively ornaments the music to a degree I've not heard before - including in his later HIP set. At first, it catches the listener off guard, but it works. The Andante is fairly straightforward, and displays both lyricism and solemnity, though not too much of the latter, while the Menuetto is just a tad slow, but still works quite well. D279, with a completion by PBS of D346 for the fourth movement, sound both lyrical and lightly dramatic, but rather than flowing with a lovely legato, PBS plays more staccato, making some passages a bit jagged, though fun. The rest of the sonata stays quite light, and the completed D346 Allegretto melds well. A very good start. Disc two includes three sonatas: D459/D459A, D537, and D557. In D459/D459A, PBS plays with more substance than the works on disc one, with an especially effective Adagio. Better still is D537, which in the opening movement blends cheer and sorrow, two traits the pianist himself writes that he sees as part of Schubert's tone, and the blend makes the piece more late-ish Schubert than normal. The second movement, slower and somber, still has a dance-like component to the playing, while the Allegro vivace largely alternates between more playful, scampering playing and more purely beautiful melodic playing. PBS puts substantial interpretive meat on the musical bone in one of the best versions, and maybe the best version, I've heard. D557 sounds flowing yet peppy, with hints of urgency to go with the intrinsic lyricism. PBS elevates this little sonata a bit, too. Disc three. D566 opens the disc, and it has the same serious and lyrical style displayed before, and a copious helping of pedal noise, which is uncommon for such old recordings. The whole thing is very fine, but the Allegretto deserves special praise for its beautiful lyricism. D568 follows. PBS seems to make this sonata even more serious and "late" Schubert sounding. To be sure, there's lyricism and lightness there where appropriate, but the playing just sounds more purposeful and serious, sort of like Brendel's approach, but better. Once again, PBS really delivers in the slow movement, an Andante here. The playing style would sound very much at home in something like D894. Disc four. The disc opens with the D571/604/570 "sonata", with the outer movements completed by the pianist. The opening movement sounds like a Liszt transcription of a Schubert lied - one of the good transcriptions. Moody and melodic, it sounds splendid. The other three movements seem more like early stand-alone piano pieces, not too surprisingly, and the work doesn't hold together especially well, but each movement works on its own. D575 follows. PBS keeps the piece light, clean, and lyrical throughout, but he imbues the whole thing with more of that late-ish style depth, and the final movement is exquisitely beautiful at times. It's really quite excellent. The disc ends with D612/613, with the outer movements finished by the pianist again, and the best is saved until last. PBS plays with a light touch, and the music is bright and beautiful and precious and equal parts playful and eminently lyrical. While PBS doesn't conjure late Schubert sound, there's something intensely alluring about the music and playing. In this set, PBS is turning out to almost own the early sonatas – though Wilhelm Kempff prevents that in the end. Disc five. This starts in on the real good stuff, namely the first of two recordings of D664, along with D784. First, though, is D625/505. Okay, this is good stuff, too, with Badura playing with slightly tamped down lyricism and slightly emphasized drama, again rendering the music sort of like a Liszt transcription of Schubert. The concluding Allegro sounds like a pre-echo of the concluding movement of Chopin's Second Sonata. PBS plays D664 more or less with endless lyrical beauty, with a bit of heft or forlornness tossed in for effect. It works extremely well. In the booklet notes, PBS writes that he considers D784 to be Schubert's creative reaction to the onset of his illness, and this translates to tense, agitated playing in the Allegro giusto, though the aged sound doesn't really allow for thundering dynamic range to really emphasize the underlying tumult. The Andante is quick, lyrical, and a bit sad, while PBS ratchets up the intensity in the Allegro vivace, with slightly beefier fortissimo playing, though again the aged sound limits ultimate impact. Still, this is an excellent version and caps off yet another fine disc. Disc six. It opens with D840, with PBS' completions of the third and fourth movements. While the Moderato contains plenty of lyrical playing, it also displays ample agitated, almost angry playing, though as with D784, the dynamic range of the now aged recordings deprives the listener of some sonic impact that was obviously present in the playing. Too, it takes on a sense of darkness and dreariness present in the great song cycles. The Andante keeps the whole late lied feel to it, with a sense of tension to go with the lyricism. The two completed movements work well enough, though the sonata sounds somewhat lopsided, with the weightier first two movements. The first recording of D845 follows. PBS opts for the fast, agitated, tense, biting approach in the opening movement, and the dynamic range of the recording helps out more here, and he comes as close as anyone I've heard to matching Friedrich Gulda in terms of intensity in the immoderate Moderato. PBS backs way off in the opening of theme of the Andante, but he then reverts to a tenser, more biting style for some of the variations. Both the Scherzo and Rondo go the unusually robust route, too, with a lyrical sense popping up at times in the Rondo, but this performance isn't really about that. This is a great performance of this sonata. Disc seven. The first recording of D850 starts things off. Coming right after a tense and fast D845, the somewhat more restrained, in terms of tempo, Allegro vivace requires a bit of adjustment - one bar, maybe two. PBS doesn't skimp on dynamics and effective accents, though, that is sure, and the movement remains forward moving. The Con moto is nicely paced and has a sense of melancholy mixed in, and while there's ample lyricism, the movement doesn't really flow as well as some others. Nonetheless, it works very well, indeed. To the extent one can kvetch about the second movement, it would be well-nigh impossible to do so about the Scherzo, alternating between more assertive, playful playing, and lovely lyricism. It hits the spot. As does the Rondo, which opens in a delightful, sweet, dancing manner, and PBS keeps the tone light throughout. Overall, this is one of the best versions I've heard. Next up, D894. PBS brings the Molto moderato e cantabile at 17' even, so it's got room to breathe. He opens slowly and introspectively, and he never really plays too fast, but he does speed things up and play some louder passages with some nice heft. Of course, one cannot expect the titanic dynamic range of Michail Lifits or Arcadi Volodos in an old recording, and PBS doesn't even seem to be trying to play with such range, but the effortless, flowing forward momentum make that largely irrelevant. The Andante continues along in a similar vein, with the forte passages comparatively more intense than in the opening movement. In the Menuetto, the outer sections display some tumultuous playing mixed with more beautiful playing, while the middle is tender and lovely. The Allegretto is more relaxed in overall feel. Competition is stiffer in this sonata, and if PBS doesn't quite match up to my favorites, this recording is still very fine, indeed. Disc eight. D958 opens it. The Allegro has some nice contrasts. It starts a bit hard and moderately fast, but then quickly backs way off in both tempo and dynamics. Returns to the opening material start off slow and gradually build up speed and strength each time before reverting to slow playing. At times, the playing borders on being too slow, and some may very well think it is. The same is true of the Adagio, which starts off quite slow. It lacks enough drama to really make it work, at least in the first theme and every return. The second theme is more vibrant and dramatic and works a bit better. The Allegro keeps the slow approach, but works better owing to a tunefully solemn style, which carries over into the less successful trio. The concluding Allegro finally finds PBS playing with less restraint, with a propulsive rhythm, and some seriously clear left hand playing. Unfortunately, tape overload and distortion is seriously clear, too, as it was from time to time earlier in the piece. This isn't so much a problem with the second theme, which is of the endless melody variety of playing, but it is for almost everything else. The first of (sort of) two recordings of D959 follows. It retains the sub-par sound, though it sheds the too-slowness of D958. PBS keeps things lyrical and moving along, but coming so relatively soon after Zimerman's super-human playing (and SOTA+ sound), this is more plain, though more plain also means more introverted and smaller scale, with more conventionally scaled dynamic contrasts. The Andantino is of the slow, mostly subdued, somber variety, with just enough melodic goodness to satisfy before the tumultuous middle section. The Scherzo is alternately energetic and calm, and mostly lyrical, though one can hear some hard hit notes here and there. The Rondo comes close to an endless melody approach much of the time, the more turbulent development excepted, and if the sound was close to SOTA for its age, it would have been even better. Disc nine is devoted to the first recording of D960 in the set, though it was the second one released. It comes in at forty-one minutes. PBS plays the Molto moderato at a lengthy 19'19" but it doesn't sound particularly slow most of the time, has a bit of edge in louder passages, some agitation in the repeated left hand notes, and more of a tense classical vibe than a dark romantic one, though around halfway through it becomes a bit more forlorn. The Andante doesn't become the center of the work, but it does sound starker, more austere, though not without lyricism, and some nifty left hand playing. The Scherzo sounds mostly light and fleet, as does the Allegro ma non troppo, though PBS does infuse a bit of bite in places. Overall, it's a good rendition, but ultimately it's not what I tend to listen for. Disc ten contains D959 and D960. The first, second, and fourth movements of D959 are the same recordings as on disc eight. This Scherzo was recorded in 1967, while the one on disc eight was recorded in 1971. This one is about thirty seconds slower, and with adjustments for tempo, leaves the same general impression as the other recording, with the exception of the notably slower and sweeter trio and some repeated use of rubato. D960 however, is an entirely different recording, made in 1967, that was replaced by the 1971 recording that appeared on disc nine. A bit slower across the board than the other recording, it is noticeably different. The Molto moderato, at just under 20', is darker and more lyrical, and PBS throws in some nearly jarring accelerated passages for some reason. Overall, despite those passages, and the even more dated sound, the overall style is more my speed. The Andante is not as stark as the later recording, instead sounding more lyrical and more urgent. Both the Scherzo and Allegro ma non troppo also sound more lyrical than the later recording, with a slightly fuller and darker tone. This D960 does not rate as one of my favorites, but I do prefer it to the later recording presented on disc nine. Disc eleven contains 1968 recordings of D664 and D845. In D664, the first two movements are very slightly slower than the take on disc 5, which when combined with the slightly warmer sound, results in an even more attractive endless melody style that works just swell, and probably just a smidge better than the other recording. D845 is a few seconds slower in all movements except the Andante, which is about a minute longer. The Moderato displays some of the same agitated and tense playing as in the prior version, just moderated a bit. The entire second movement is more relaxed and lyrical than the prior recording, and it works extremely well given the approach. But it lacks the near-"wow" factor that comes with the more robust reading. The Scherzo and Rondo both balance lyricism and energy very nicely. This recording considered on its own is superb, but it is overshadowed by the blockbuster 1971 recording. The set ends with a twelfth disc devoted to a 1967 recording of D850. The Allegro vivace is about thirty seconds slower than the previous version, and it makes a big difference. The sound is chunkier and clunkier for much of the opening, and though the movement picks up a bit, it doesn't flow as well. The dynamic contrasts are excellent, but the effect is muted. The Con moto comes in at a minute longer than the prior version, and somewhat against expectation, it flows slightly better, though the sense of melancholy is not as apparent, and some of the playing sounds more urgent. The Scherzo and Rondo both have basically identical timings, but offer something a bit different. The Scherzo adds some striking, more potent playing in the trio, while the outer sections sound amply lyrical and rhythmically bouncy, with some patches of hard-hitting playing. The Rondo is mostly light fun, with some hard-hitting playing, though as with the Scherzo that seems an attribute of the recording more than the playing. Overall, the 1971 recording presented on disc seven is superior, and it is obvious to me why it was selected to go in the LP box set of the complete sonatas. 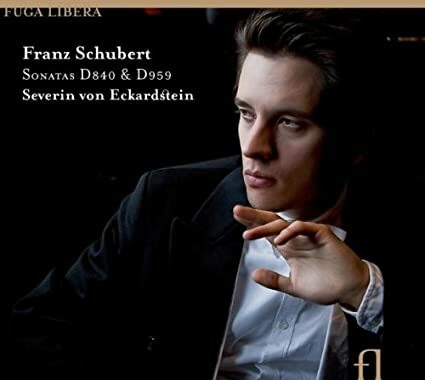 Overall, this is an outstanding set of Schubert’s sonatas, one of the best I’ve heard. It bests PBS’s later, HIP set. Only D958 ends up being a letdown, with everything else at least very good. Especially good are the early sonatas, and D845 and D850. Sonics are not up with best of the time, let alone today, but that doesn’t matter a whole lot in the end. Unlike other big box reissues I've bought, the artist's fingerprints are all over this one. Badura-Skoda penned the detailed liner notes himself, concluding with a statement that perhaps he ought to rerecord D960 (I hope he's serious, and I hope he hurries), and the remastering notes indicate that he was also very active in the process, to the point of insisting on the editing of some single notes and modifying tempos. This set very much reflects how the pianist wants the recordings to sound. That's from 2012. His liner notes are from 2017. 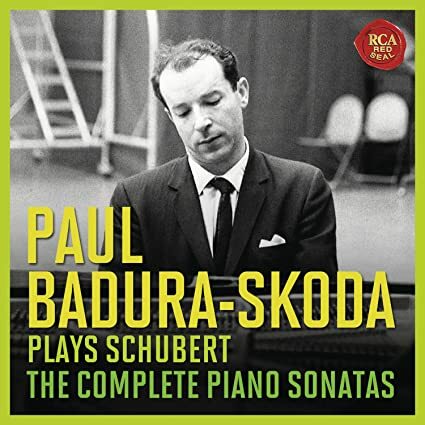 I didn't really want to buy so many CDs anymore, even less boxes and I recall Badura-Skoda as a rather uneven pianist from the bunch of recordings (Mozart, some Schubert) I heard, but I probably have to get this set. (I also only have the historic Diapason set and Zacharias and Lupus not at all complete "sets" for the less famous pieces). As for the nonagenarian pianist, I recently read a fairly ungracious comment about a concert he gave, age apparently is taking its toll, so I would not expect much from another recording. Yes I agree about this, in fact I just can't imagine anyone disagreeing, nevertheless I prefer the way he handles the piano in the Arcana recording for the colours and asperities, which I think brings something new to the game. When I think of Bengt Forsberg, I think accompanist, and then accompanist for Anne Sofie von Otter. There's nothing wrong with being known as an accompanist. I'm a big fan of Enrico Pace, and that's his bread and butter. 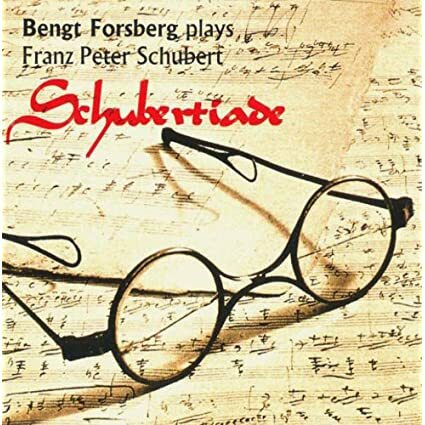 Here, Mr Forsberg gets the microphone all to himself on the aptly title Schubertiade disc. The twenty-two year old recording uses a forty-one year old Bösendorfer, adding a bit of Viennese heft to the recording. The G Major sonata starts the disc. The Molto moderato comes in at 18'37" with repeat, so a judicious tempo is used. Forsberg's playing is steady, with little in the way of highly personalized rubato. The somewhat clinically recorded Bösendorfer ends up stripping away some loveliness from the cantabile parts of the music, but the tangy upper registers tickle the ears, and when Forsberg pounds out the forte passages, there's some real oomph. While the movement never really sounds unappealing, it never really sings, though. Given that the first movement isn't ideally lyrical, it's not surprising that the Andante isn't either. Neither does it surprise that Forsberg uses his piano to hammer out the loud passages with something nearing musical aggression. There's certainly nothing wrong with hard-hitting Schubert, but it has to be done just so. The Menuetto and concluding Allegretto both display the same traits as the first two movements, and as such don't rate with my favorites. Forsberg moves to a single Impromptu, the first from D899, and it is characterized by sharp articulation and almost overbearing loud playing, with lyricism very much a secondary consideration. The Moments Musicaux are characterized by the same traits mentioned previously, though Forsberg introduces a snazzy rhythmic sense to the playing, with the third of the lot especially effective in this regard. While this doesn't end up a favorite rendition of the work, it's the best thing on the disc. It's impossible to really fault Forsberg's playing itself, but his interpretations don't work for me. 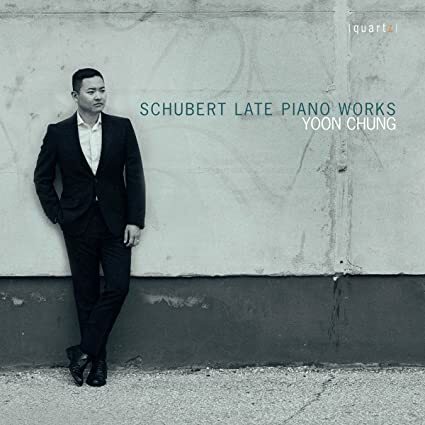 Yoon Chung is yet another of the bevy of South Korean pianists whose work I've listened to in the last couple years, and like some other artists in The Asian Invasion thread, this sole disc of Schubert is his only commercial recording to date. Chung was born in Korea but did most of his training in the UK, where he now lives. He also did some studying in Dallas under Joaquín Achúcarro, and he's done the whole competition thing, too. So, he's like a veritable army of young artists out there in possessing proper credentials. Next is D946, a work that seems to benefit more from more interventionist takes. (Listen, for example, to Sokolov or Kars.) Chung launches into the Allegro assai with ample energy and drive, but it's when the slow music arrives that he seems to be in his element. Backing off to a Karsesque tempo, and adopting a very earnest mien, though the runs are little delights, Chung revels in the music. That written, it lacks the otherworldly magic of Kars or the refinement of Sokolov. (The comparisons were not selected at random.) In the Allegretto, Chung adopts more extreme tempos at both ends of the spectrum, to mixed effect - the slow playing really comes way too close to being way too slow - but the cumulative effect is to sort of render the first two movements a nearly half-hour long fantasy. Cool. The Allegro does the fast-slow thing, too, though here the slow movement is a bit quicker and played with an attractive, gently punched out staccato style that emphasizes rhythm and fun. The whole thing comes off a bit better than the sonata. So, neither work rates among my favorite versions of what's out there, but Chung is not at all reticent about imparting his ideas to music. I would not be averse to hearing him in something else. Liszt or Szymanowski may sound just nifty. Chung owns the copyright in this recording, so one can access it free online. Mr Chung and his production team were smart enough to hire Tony Faulkner as engineer, so sound is superb, so I'm glad I got the disc instead of relying on streaming. I have greatly been enjoying this box as well; it's not Richter or Sokolov Schubert, and more classical interpretations but that is A ok with me. Severin von Eckardstein is a name new to me. The German born pianist pursued studies at high grade institutions and did the competition thing, culminating in a win at the 2003 Queen Elizabeth competition. So, he's at least competition grade. This disc of two Schubert works came to my attention when I found it on the cheap. Could it be the find of the century? The disc opens with D840. Eckardstein generally keeps the sonata lighter and more playful than is often the case. He also keeps the music moving forward in the Moderato. While not rushed, there's an energy level that approaches, but does not achieve, a sort of jitteriness. Eckardstein's articulation is generally very fine, and while often the playing is focused on the melodic content - without ever coming close to sounding too soft or cloy - his Schimmel piano and the recording technique allow for the bass line to sort of creep up on the listener in a few spots. The piano's bright, crisp upper registers also become prominent a couple time, to ear catching effect. In the Andante, Eckardstein doesn't really let the music flow, instead emphasizing staccato playing and dynamic contrasts. A few times, the comparative lack of suitable musical flow does detract a bit, but at others there's an entirely unsentimental feel that appeals. The movement and sonata is something of a mixed bag. D959 follows. The potent bass notes stand out in the Allegro, which is mostly of the forward moving, assertive variety. While Eckardstein doesn't skimp entirely on lyricism, it seems something of a secondary focus. The near-jittery style from D840 reappears, too, making this more assertive than many other versions. Just an observation. Eckardstein makes the Andantino the center of the work. Forlorn and at times spare, the playing is lovely and restrained much of the time, but the restraint masks something beneath the surface, something that erupts in short bursts throughout. The rolled chords near the coda take on extra significance here. The Scherzo is punchy and near-jittery in the outer sections and more lyrical in the middle. 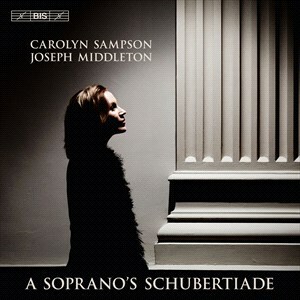 It's quite nice, if not "late" Schubert profound in a more standard sense. The Rondo does find Eckardstein delivering some more purely beautiful melodic playing, with more potent playing less common, though the passage before the coda and coda itself have some belted out music. Overall, this sonata is not one of the great recordings, but there's enough there to return to again. In perusing the pianist's recordings, it looks like he does some standard fare, some lesser fare, and some modern fare. I'm thinking the last category might be worth exploring. 840 is one of the sonatas I'm slightly curious about, so I know this recording by Severin von Eckardstein. The incisive phrasing seems to me the most salient feature of the performance. I wouldn't have chosen playful(er) or light(er) as epithets -- but so often with me how I interpret the performance depends somewhat on my mood when I'm listening. 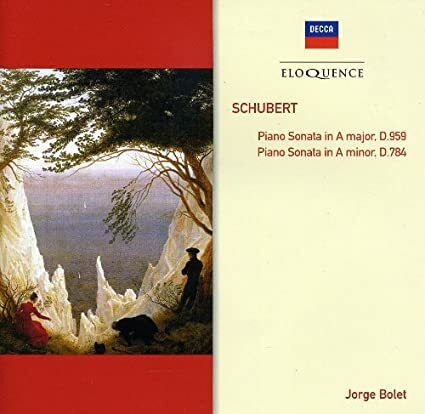 The way the andante is slightly static seems to me quite interesting in fact, as I have a little theory that Schubert was exploring stasis -- that's why I've explored this sonata a bit. Shame he didn't play the third movement, and I'd have even liked the 4th. There can be no reason for not playing the menuetto can there? Is there a problem in the manuscript or something. I can't remember a thing about the 959, I don't like the piano sound at all, it seems horribly hard and the tones too pure and free of interesting partials to be musical. He has his own reasons for choosing such an instrument for this music I guess. I can imagine he does some "belting out" -- he's that sort of musician. There seem to be many recordings of D 840 including only the first two movements, e.g. Brendel, R. Serkin or P. Lewis. 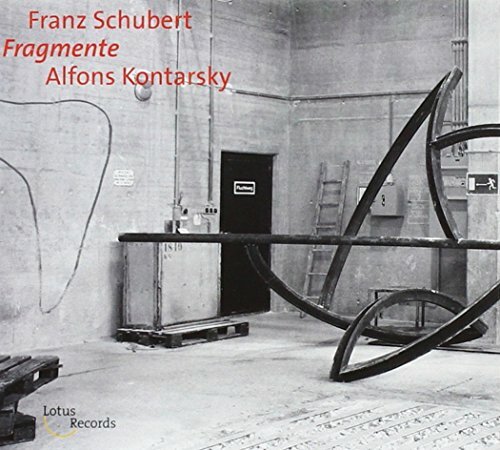 have you heard Kontarsky and Pludermacher with fragmentary 4 mvmt and completed versions, respectively? I don't think so, I'm pretty curious about the Kontarsky. My current favourite in the sonata is Massimiliano Damerini. 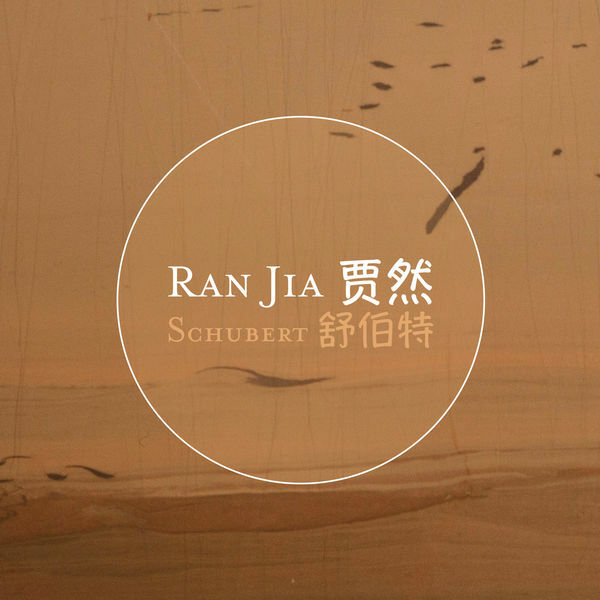 I got tired of waiting around for some record company to issue a new Ran Jia recording, so I decided to revisit her Schubert with her first commercial recording of two sonatas, here the always successful pairing of D960 and D664. This time around, I had to go the download route since physical media was impossible to find. The download I got happens to be of the 24 bit variety, which appears to be the only format available for purchase. Jia starts off with D960, and her Molto moderato is of the long, slow variety, coming in at just a hair over twenty minutes. One really wouldn't sense that initially as she plays with a steady pulse and keeps it up throughout. As in her later disc, her style has little time for sentiment or contemplation. It is harder hitting, though at times even more beautiful than what one hears on the RCA disc. What is also clear is that Jia likes to make the lower register thunder, whether in the bass trills or in passages with more lower register playing. Too, she doesn't limit her hard hitting playing to just the lower registers; forte sections have steel in them, and hints of anger more than despair. Her anodized aluminum in comfy suede gloves style is evident in this recording. The anger, the bite, the tension that pervades the movement makes it seem to go by more quickly than it does, even if it's not deep. A few times, Jia's delivery of some right hand passages, including some arpeggios near the end, are especially ear-catching. Jia pulls off much the same trick in the Andante sostenuto, which manages to sound a bit rushed while still coming it at over ten minutes. That is down solely to the tension in the playing. Again, it's not the deepest or most affecting take, but it works better than it should. Jia moves right through the Scherzo at a brisk sounding pulse, with ample drive and dynamic contrast and she ends the sonata with an Allegro ma non troppo that, like Zimerman after her but to a lesser extent than the more famous pianist, uses clipped G-naturals. She also pokes out some of the bass notes underneath the melodies to good effect, and grinds out the more intense passages most effectively. So, not one of the very best readings available, but very much in line with her RCA recording and very well worth hearing. In D664, Jia shows that she can plays just about as beautifully as anyone as she produces a stream of musical gorgeousness for much of the movement. She can still unload, though, and the loud passages seem better suited to D784, though Jia plays them nicely. One thing that sort of stuck out more than normal is how the coda sounds, or can sound, very much like Beethoven, while the rest of the movement sounds very Schubertian. In the Andante, Jia plays with more feeling and depth than is typical in her style. It's far from sentimental, but she lavishes very nuanced attention on the notes, creating something and dramatic, but not overstated. The Allegro is spritely and delivered with a bouncy rhythm in the mix with Jia's standard, hard-hitting playing. Overall, I tend to prefer a more lyrical approach, but Jia makes a strong case for her approach. Her case is so strong that I now hope another disc gets released soon, on whatever label. Sound quality is top shelf, but somewhat close, with a fair amount of damper mechanism noise. Jorge Bolet is one of the grand old pianists who recorded a fair amount and did generally good or excellent work. His late-career Decca Liszt recordings demonstrate his affinity for the composer and are quite nice. Better are his RCA and Ensayo recordings, which were issued in an RCA box for a brief time, where Bolet plays with more fire and brilliance. I wasn't really looking for anything from him, but when this reissue of his late-career Decca Schubert popped up for next to nothing, I decided to give it a shot. The disc opens with D959. Bolet starts with an Allegro characterized by steady and stately tempo, reserve, and some very clear playing that simultaneously sounds a bit chunky and excessively sober. The Andantino is broad of tempo and both somber and lyrical, but the reserve hampers it. Bolet's Scherzo is too stiff and chunky in the outer sections, though the trio is quite fine. Things end well enough with a Rondo that glides along with an attractive if reserved lyricism. So, a decent reading. D784 closes the disc, and Bolet displays the same traits. The reserve remains, and the somewhat chunky sound turns stiff here, and when combined with curiously limited dynamics, yields an anemic Allegro, robbed of drama. The Andante is generally nice, and the Allegro vivace manages to be both appealing in its way, but it's also more Andante than Allegro. It's too slow and enervated, and the lack of dynamic contrasts renders a less than fully satisfying ending. Less than fully satisfying is the best way to describe the disc as a whole. Rarely has the word "meh" been as useful when assessing this disc. I'm glad I got it cheap. Ending the latest batch of Schubert recordings with the one I've owned the longest. I'm a big fan of Alexander Lonquich, so I was predisposed to like this set. I also happen to like his older Schubert recordings that I've listened to via YouTube, so all signs pointed to a fine twofer. Lonquich handily exceeded expectations and delivered one of my purchases of 2018. I decided, after multiple most enjoyable listens, to scribble about it. I generally cover pieces as they are presented on disc, but here I'm starting with highest highlight of the set, one of the greatest recordings of D959 I've heard. Possibly the greatest. Lonquich starts with loud and powerful forte chords, which also sound broad of tempo and large of scale. He brings the movement in at 17'50", so energized, speedy drama is not what the playing is all about. It's more about clean articulation, supreme clarity, wide-ranging dynamics, with incredibly fine differentiation at all levels - why shouldn't p have at least ten fluidly variably levels? It's also about a second theme that while highly lyrical, sort of sounds deconstructed, a gorgeous and searching musical breakdown of each and every constituent part. Lonquich, as in all his recordings, plays with strongly individual ideas. He doesn't hold back on personal rubato or accents, not at all. Indeed, he weaves them seamlessly into the musical fabric throughout. Nary a bar goes by without him inserting his personality. The playing is beautiful or fierce (or an approximation of fierce) where it should be. The Andantino starts off daringly slow, with Lonquich playing the melody in a largely jagged staccato style, especially with the right hand. The awesome clarity sounds awesomer when he obviously desynchronizes the hands, with continuous, miniature melodic blocks the occasional result. Lonquich fires things up in the middle section, thundering out playing. The end of the section and transition again slows things down, with dynamic and tempo reductions that heighten the drama that preceded it. The repeat of the first theme is a bit quicker and more forlorn than the first presentation of the material. Nice. The Scherzo continues on an intriguing mix of jagged playing and lyricism that works quite well. The middle section is especially effective in its striking dynamic shifts. In the Rondo, Lonquich plays with a more unaffected lyricism, though he can't help from deploying rubato and personal (micro-) tweaks to note values here, there, and everywhere. The movement sounds generally lighter in tone and more fluid than the rest of the sonata. That's not to write that he neglects intensity in the middle section, because he plays with ample oomph. 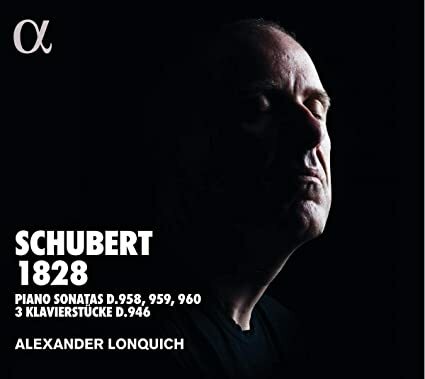 While I very often prefer my Schubert on the more purely lyrical side overall, with shades of darkness pervading the late sonatas, in particular, Lonquich's approach is unique and backed by exceptionally fine playing. There are, of course, many fine recordings of this work, but I don't know if I can say any are better. I would be tempted to say this is a potential long-term reference for modern, SOTA sound sets, but Arcadi Volodos is out there, performing this very sonata. If he lays down a studio version, it may set a new and different standard. Until that day hopefully arrives (hopefully very soon), this will be my go-to for current versions. Moving back to D958, Lonquich launches the opening Allegro with potent, quasi-mini-orchestral chords and a perfectly judged tempo, evoking a bit of drive and oomph. It's entirely and eminently satisfying. But it's the slow second theme and the transitions where the magic happens. Yes, there may be even better executed scales out there, though I can't think of any. This is how to transition. And then the slow music is very slow, filled with micro-pauses and personal note value changes, and replete with so many dynamic gradations that one almost wants to measure them. (Really, the mezzo-piano to mezzo-forte range is superbly rendered, with even shadings shaded.) None of this would really matter much if it were not for the lyrical and tonal beauty married to an almost fantastic sound world. It is entirely possible to find the playing too mannered, but mannerism makes the music here. The Adagio ends up mixing a slow, somber, contemplative sound with passages of no little intensity. A neat little trick that Lonquich uses involves desynchronizing hands when playing some ascending volume sforzandi. It lends a certain controlled frenzy feel to things. Lonquich's almost crazy clarity also lends a simultaneously controlled and unmoored feel to the music. The Menuetto might almost be considered too mannered. The outer Allegro sections are just nifty in terms of energy and drive, but the trio is laden with so much rubato that some might find it distracting. That written, the terraced dynamics between left and right hand, and that awesome clarity, offer unique rewards all their own. The Allegro possesses more forward drive and rhythmic snap than the preceding movement, but what continues to stand out is the clarity and the dynamic control. Here, it's the swelling fortes, anchored by beefy but pristine left hand playing, that really catch the ear, at least until some of the gentle quiet right hand playing manages to dominate, despite its gentleness. The playing doesn't flow in the best, most lyrical way, but it doesn't matter a whit. In D960, Lonquich goes for the super-long Molto moderato approach, taking just shy of twenty-four minutes to finish it. He keeps the pulse pretty steady, though he can't help but throw in personal rubato and occasionally, and most effectively, accent certain bass notes. The bass trills are nearly exaggerated, and some silences and note values most definitely are; those who dislike agogics for interpretive effect will find much to dislike. Me, I like, especially if it's well done. That written, the movement often seems to lack a core, or to possess the emotional weight of some readings; it often seems to be abount momentary effect. Typically, I prefer dark 'n' dismal takes on the sonata, with a first movement weighting, but in some instances, as here, that doesn't matter as much. It matters much less when the Andante becomes the center of the work, as it most certainly does in this recording. Again, Lonquich does not go for a particularly fluid, lyrical style in the outer sections, instead relying on agogics and rubato to create a dark, introspective soundworld, made the more so when he plays softly. It's really quite masterful. The middle section stays on the slow side, but the insistent left hand playing and darkly tuneful right hand playing offers a contrast from the music before and after. And in the return of the opening material, Lonquich adds some additional dynamic contrast, this time more on the louder end, to super dramatic effect. He opens the Scherzo lightly and gently, and rapidly increases volume and tension to just right levels, and closes with a nearly conventional Allegro ma non troppo. He still finds time to vary dynamics nicely, especially on the pianissimo to piano end of the spectrum, and he plays with more rhythmic steadiness much of the time. The playing is largely shorn of emotional baggage, as is delivered most handsomely. The twofer ends with D946. Lonquich changes approaches here, going for a straight-forward quick, potent opening before backing way off for a slow, darker middle section, which is prone to some nicely timed and perfectly executed forte outbursts. The transition back to the first theme is masterful, almost to a Karsian level. Quasi-Karsian is the slow second piece. Lonquich does play with admirable tonal refinement, as well as some more nicely accented bass notes, but it's earthbound compared to Kars. When compared to most other pianists, Lonquich's take is extra-spiffy, though. Relatively best of all is the third piece. Smaller and shorter than its predecessors, in many full sets, it seems like a lesser composition, but Lonquich lavishes the same attention on all aspects of the playing, making sure to hammer out the middle section to great effect. Alexander Lonquich is one of those pianists I just seem to enjoy all the more for his individual, idiosyncratic interpretations, backed up by stellar playing. This latest Schubert twofer does not disappoint. Now, if only Warner will see fit to reissue his 90s recordings in a handy-dandy box one day. It seems like a complete pirate site full of malware. Does anyone know what isw going on?